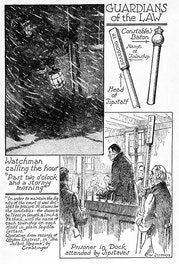 A period of depression in Great Britain followed the cessation of the Napoleonic war. The army was reduced, and many officers were retired on half-pay. Farm labourers, artisans, small tradesmen, gentry, soldiers and civilians all felt the pinch of hard times. Many sought relief by emigrating to North America, and throughout the years of the twenties and thirties a flood of newcomers poured in to Canada. 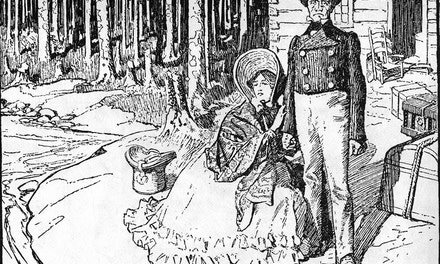 Among them were many gentlefolk, accustomed to the comforts and refinements of the old land, who found life in the backwoods painful, difficult and discouraging. Some succumbed in the struggle, but many also resolutely set themselves to the task of building a new life for themselves and their children, and succeeded in establishing comfortable homes and prosperous communities. 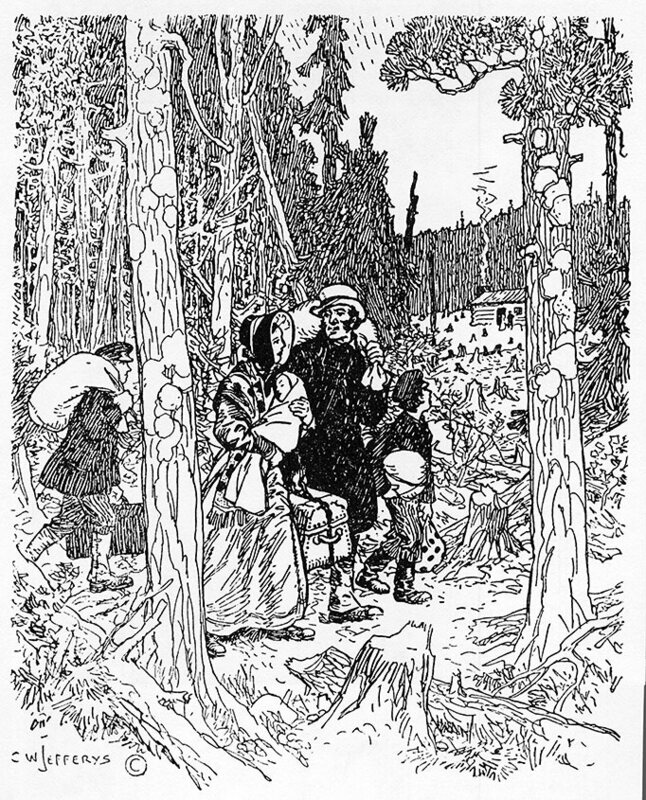 The drawing attempts to express the situation of these people set down in the midst of the lonely wilderness, as it is poignantly described in such books as Mrs. Moodie's Roughing it in the bush, Mrs. Traill's Backwoods of Canada, and Mrs. Stewart's Our Forest Home. Burtniak, John and Dirks, Patricia G., eds.. Immigration and settlement n the Niagara Peninsula: proceedings, third annual Niagara Peninsula history conference, Brock University, 25-26 April 1981. St. Catharines, Ont., Brock University, 1981. Illus.